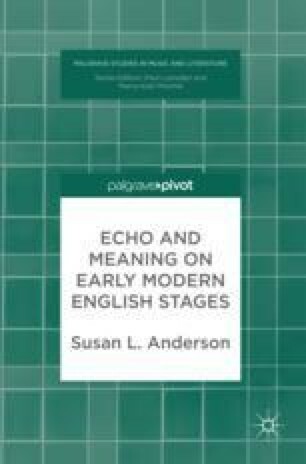 This chapter examines the way echo was used in progress entertainments staged for Queen Elizabeth, focusing in particular on the hospitality staged at Elvetham (1591) and Kenilworth (1575). Anderson demonstrates the patterns of repetition that can be traced through these events. In particular, the use of echo as a performance device at Kenilworth is repeated or referenced in several later entertainments, including Bisham (1592), and adapted into a musical device at Elvetham. This chapter explores the ways sounds, musical ensembles and musical genres heard at prior events are revisited, revised and re-heard in different locations and contexts, developing an acoustics of courtly entertainments in which the signs of musical sophistication are also political assertions. Anderson, Susan. 2008.“‘A true Copie’: Gascoigne’s Princely Pleasures and the textual representation of courtly performance.” Early Modern Literary Studies 14 (1): 6.1–43. http://purl.oclc.org/emls/14-1/article5.htm. Edwards, Warwick. 2001. Consort. In Grove Music Online, ed. L. Macy. http://www.grovemusic.com. Harrison, William. 1587. An Historicall Description of the Iland of Britaine, In The Holinshed Project, ed. Ian W. Archer, Felicity Heal, Paulina Kewes, and Henry Summerson. http://english.nsms.ox.ac.uk/holinshed/.